Having a cat is not all about the lovely company, it is also good for your physical as well as psychic health. This is actually what researchers have demonstrated study after study, and that proves to be true. But how do cats contribute to the well-being of their owners? You will be surprised to discover all the positive effects they can have on us! If you to heal up your heart, you only got to have a cat! For ten years researchers from The Stroke Institute of Minnesota have been conducting a study on owners and non-homeowners to demonstrate the benefits of having cats on heart health. Results: 30% of cats owners are less likely to die from a heart attack or stroke than non-cat owners. Feeling some kind of isolation? Not if you have your cat around! The company of a cat would make you feel better especially when you are of a isolated nature. Whether you are a widow or a single, having a cat company is extremely beneficial. You ought to feel good when you caress your cat! You probably noticed it when you caress an animal, it makes you feel calmer! Indeed, cuddling a cat has a soothing effect that lowers blood pressure. This is what has been confirmed through a study conducted by the University at Buffalo- University of New York. The study backed up the opinion that cats are more likely to lower the blood pressure of their owners. Taking care of your cat and especially having a cat to cuddle helps to reduce the level of stress. The purring of the cat has a relaxing effect on the owner. Unlike dogs, most cats require little care. You feed them and clean their litter. Sometimes, when an animal needs a lot of care and attention, it can actually add extra stress to the owner. If the cat calms us, it also has positive effects on our mental health especially on old people, students and those with chronic illnesses. It does us good and helps us stick to the positive side of life. 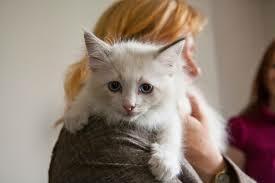 The purring of the cat has a meditative rhythm that helps you concentrate especially when you take it in your arms. As Shawn Simons, founder of the nonprofitable Kitty Bungalow. Charm School for Wayward Cats in Los Angeles, says: the frequency of the purring of the cat can actually cure bone fractures. Unlike other animals, cats can live 20 years or the equivalent of 100 years in human life. A longevity that often coincides with that of their owner. The latter would live longer than those who do not own a cat. As we have seen, having a cat can ensures safety, health, and well being: lowering blood pressure, reducing stress, better heart health and also living longer. But you do not have to have a cat! All these benefits make you eager to have a cat? If you can not afford adopting a small companion, be aware that the benefits extend to the videos. Moral of history? Cats are just awesome! You will not be able to do without them as they are beneficial for your health. You have noticed the benefits of your pet on your health, we look forward to reading your story! Leave us a comment below or on our Facebook page!